Isn't this picture familiar? 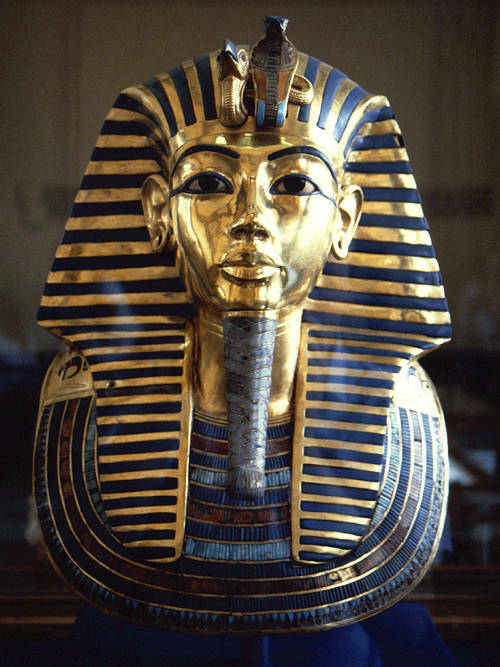 It is one of the most celebrated icons of Ancient Egypt - the mask of Pharaoh Tutankhamen's mummy discovered in the year 1922. 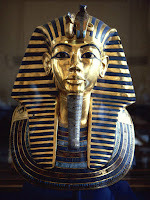 Now who is King Tutankhamen? Many many years ago (history tells me it's 1351 B.C) Egypt was ruled by a pharaoh called Amenhotep IV, son of the mighty Amenhotep III. Unlike his father though, Amenhotep IV (also known as Akhenaten) was unpopular because he proclaimed that all of Egypt should worship only one God - the God of the Sun. To ensure this, he destroyed several temples of the old faith and established a new capital city. When Amenhotep IV suddenly died, his brother* Tutankhamen was heir apparent. But the people were worried - for he was only ten years old, so small, so meek. Could this child really be the last heir to the throne of Egypt? Could a boy be pharaoh? When he is unexpectedly anointed pharaoh at the age of ten, he goes on to rebuild and bring back the old faith to Egypt, thus restoring the country to its former glory. Take the distinctive art and culture of Ancient Egypt and the unusual story of a boy king (Kings do have a special place in the heart of children, don't they?) Now add the noted illustrator Robert Sabuda to the mix - and what do you have but an amazing treat. * As the Notes on the Text at the back of the book say : "Historical facts from such ancient civilizations as Egypt's are often difficult to determine and are much debated by scholars." 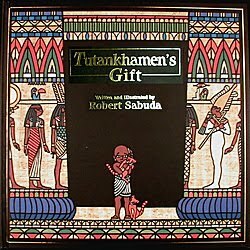 This book was printed in 1994, but in 2010 a DNA test determined that in reality Tutankhamen was not the son of Amenhotep III as the book claims but the son of Amenhotep IV. What's more, he is also referred to as son in law of Amenhotep IV, since Tutankhamen married to his own half sister (Amenhotep IV's daughter from another queen). A boy king story in the backdrop of ancient Egypt - wow! Neatly done review. Thanks Poppins. Ever since I read about him, I have thought that the name Akhenaten sounds a lot like "Ekanathan" meaning One God and his Sun Temple was built at Karnak while we still have a Sun temple at Konark. Interesting tidbit, right? Boo, that IS true:)) Cool! I remember reading "Ra" as the Sun God in mid-school history. a fascination for all things Egypt started last year in my (then) 4yo, after he made an apple "mummy" and pyramid cakes at school. this is a book he's sure to fall head over heels over. thanks for the crisp review! So enlightening, Sunita! Thank you so much for an awesome review of a story from the ancient world! The eight year old in the family is learning ancient civilizations this year. Coincidentally, they started Ancient Egypt, just this week! At the end of it, she will be doing a research project. We both have loved learning about Egypt from a school-recommended website! Can pass on the link if someone is interested. Incredible stuff! Her class is reading the non-fiction magic treehouse mummies and pharoahs research guide this week. 'Robert Sabuda' caught my eye even before I went further down the review! Know of his pop-ups, didn’t know about these ones. Thanks, will look out for this one. Sounds great! And we have a pile of children’s books on Egypt (got from the Museum of Egyptian Archaelogy in London), if your lil one gets into Egyptology, do let me know, she might find them interesting - we can lend them to you. Good one, Div is Egypt crazy these days thanks to school history...will look out for this! Nice review Poppy! Does walking around with "Tutankhamen's gift" all the time, poring over "Ancient Egypt" in the encyclopedia and wanting to be dressed as an Egyptian Mummy for fancy dress next year count as Egypto-philia? If so then my 5 yo has that very disease. @Kodi's Mom: Not Kodi too! Looks our kids streak of liking the same things, continues unabated. @Chox: When I saw this book I thought it was a pop up too. Drooling at the thought of a pop up book with Egypt as its theme. @Meera: Thanks! I remember the Ra thing too. @Starry: Another Egypt fan! Truly it's an extremely interesting culture. Well you can add many more Egypt fans to the list, Poppy, yours truly and daughter. It is such a fascinating civilisation with an equally fascinating mythology. Thanks for this one. And I so agree with you- "a history lesson, retold the way all history lessons should be - as an engrossing story." Where do you find these gems Poppins mom? Must tell the husband that Egypt is calling. I see signs every where. Lovely review, Poppins, enjoyed reading it! Quite an interesting tidbit there, Boo, about Akhenatan and Karnak. This book will be on our list to follow up and learn more. Poppy - you've picked some brilliant books. Where did you find them? Incidentally, spotted a book called The Golden Goblet today. Historical fiction based Ancient Egypt. So gripping that it was devoured up in the young Egyptophile in these parts in the wink of an eye. A Newberry Honor book and highly reco’ed by said E’phile. Will report back once I’m through with it. @Art: I know you did a cluster post on pop ups didnt you? @Sandhya: The list keeps growing, but i agree what a fascinating culture! @Utbtkids: Found it at the fount : the Hippocampus library in Bangalore. Macchu Picchu all done, now Egypt? Am envious! @Sheela: Wow now that book sounds fascinating must look it up. @TMM: Mostly at a wonderful children's library called Hippocampus in Bangalore. Brundibar was from a used bookstore called Blossoms. @ChoxBox: Wow. Wow. Please report back, must check it out. Poppy, Machu Pichu not done. Poppy, we read this book yesterday, and just as the last page was closed, the 5yo summed it up in one big 'wow'. I don't have to tell you how many more times we're going to be reading it in the coming weeks! illustrations just popped out, Sabuda does his magic even on 2d. @Kodi's Mom: Am so glad Kodi liked it. Yes the papyrus style illustrations are great - loved your choice of words- 'pop out'. Tutankamouse is just so hilarious.